Skiing as a winter sport or recreation was in its infancy in Victoria when the University Ski Club – now the third oldest in the State – was formed in 1929 as the Melbourne University Ski Club. By the mid-1920’s, New South Wales had more than half a dozen ski clubs which in 1928 formed a State Ski Council. Among them was the Sydney University Ski Club, then in its second year. One might digress here for a moment to bear in mind that right up to the present day, all skiing development in New South Wales has been concentrated naturally (i.e. geographically) and contigually within the one area radiating from Cooma. On the other hand, Victoria’s populated skifields are dispersed in the northern, central and southern regions of the Eastern Highlands, with separate approaches and Melbourne the only gateway common to all three. An unrelated namesake, R. W. Wilkinson ventured further afield around 1910-12, making trips from St. Bernard to Hotham and Loch and, with the Norwegian Consul, Mr. Hans Fay, skiing across the Razorback to Feathertop. He had been introduced to skis on a day visit to Buffalo in 1909 – the year after the road from Porepunkah to the Plateau (formerly a bridle track) was constructed. Opening of the Government Chalet at Buffalo in 1910 brought the novelties of a winter holiday in the snow within the reach of the public, who sampled such delights as making snowmen, ice skating on Lake Catani, tobogganing and sliding downhill on pieces of hardwood held to the feet by leather thongs. Importation of some skis from her native Norway in 1920 by Miss Hilda Samsing, lessee of the Chalet until the Victorian Railways took over in 1924, encouraged more holidaymakers to try out their snow legs. Among those who enjoyed the exhilarating experience of the new sport at Buffalo was a group of enthusiasts who, in 1924, formed the Ski Club of Victoria, which became the State controlling body. The following year Buffalo patrons were also responsible for the birth of the Chamois Club, and in 1927 the Mt. Buffalo Alpine Club – long since disappeared – was formed. Buffalo graduated from cradle to nursery, its advantages easy access and comfortable accommodation, its disadvantages limited terrain and short, unreliable, snow seasons. Nevertheless for skiers more serious than the so-dubbed “Woollies Brigade” (the “snow bunnies” of yesteryear) it provided an opportunity to gain experience before venturing further afield. Buffalo also acquired Australia’s first ski tow (rope variety, Cresta Run, 1937) and had Victoria’s first overseas ski instructor (Franz Skardarasy, of Austria, 1936). Rightly the S.C.V. merits the credit of pioneering organised skiing in the State. U.S.C. however, has not been without its contribution to the development of the sport over the years. In the S.C.V.’s first season its members made trips to Donna Buang, Buller and the Bogong High Plains. The following year (1925) when, thanks to its efforts, the St. Bernard Hospice (dating from 1882) was re-opened for winters to provide yearround accommodation and succour, an S.C.V. party pressed on the six miles from here to Hotham at King’s Birthday weekend. These skiers became the first paying guests of Country Roads Board patrolman Bill Spargo at the newly-built C.R.B. Cottage, which subsequently became known as Hotham Heights. By the time the Melbourne University Ski Club came into being, S.C.V. members had made the first winter sojourn on the Bogong High Plains (1925), and the first crossing the following year, as well as the first winter ascents of Mrs. Fainter (1927) and Bogong (1928). In the University May vacation of 1929, two medical students – M. O. Kent Hughes and P. H. Wood – visited St. Bernard. They returned to Melbourne full of enthusiasm for skiing and its possibilities as a group activity in the University. On June 24 they arranged a lunchtime lecture by the S.C.V. President, R. W. Wilkinson, and the following day convened a meeting of likely starters. Those who attended, in addition to the convenors, were H. S. Bates, J. D. W. Begg, H. Bennett, F. Canavan, G. Cohen, R. G. C. de Crespigny, R. E. Elford, J. S. Legge, M. M. McColl, L. Nichterlein, A. J. Perry and 1. K. Whittaker. An apology was received from R. T. E. Latham, who was included among the foundation members. The meeting determined “to form a Club, to be called the Melbourne University Ski Club, with the object of bringing together those members of the University who are interested in skiing and popularising skiing among past and present members of the University”. A constitution was drawn up and Paul Wood was elected President, with Warrand Begg honorary Secretary-Treasurer. Selwyn Bates, Roger De Crespigny, Monty Kent Hughes and Malcolm McColl formed the committee. Messrs. H. W. (“Barney”) Allen, President of the Melbourne University Sports Union and Vicemaster of Ormond College, John F. Foster, assistant Registrar of the University, and Gerald V. Rush, co-founder and first honorary Secretary of the S.C.V., became Vice-presidents, Dr. Charles H. Osborn and Dr. David Yoffa being added to their number later in the year. “Barney” Allen was to continue a long and helpful association with the Club, not only as a Vice-president annually until 1945 and honorary Auditor for 17 years, but also as a valued adviser and advocate in bringing about recognition of skiing as an official inter-‘varsity sport. Paul Wood was elected a Vice-president the following year and again in 1931, by which time he was a fledgling doctor in New Zealand and a member of the Canterbury Winter Sports Club. At the Hermitage championships at Ball Pass, Mt. Cook, that year, he won the Open Challenge Cup and its three contributing events. In 1933 he went to England to do post-graduate work and became a noted heart surgeon; at the time of his death in 1962, aged 55, he was Director of the Institute of Cardiology in London. Monty Kent Hughes, who died in Melbourne early in 1976, aged 69, also left his mark in the medical field. Regarded as a world leader in medical practitioner training, he was one of the first Australian doctors to establish a group clinic, where he practised until his death. In 1930 and again in 1937-39, 1941 and 1943 he was a Vice-president. Of the other “originals”, only Warrand Begg, Malcolm McColl, Selwyn Bates(committee 1929-32) and Ivor Whittaker continued membership for more than a handful of years. Begg and Bates were already S.C.V. members when the Club was formed and with McColl had skied at Buller and on the Bogong High Plains. Today Warrand is the only one still in the Club, which elected him its first Honorary Life Member in 1955. He was also the only foundation member present at the Club’s Jubilee Dinner in October, 1979, when apologies were received from Selwyn Bates, Frank Canavan and Geoffrey Cohen. Three of the foundation members could not be traced at the time and eight were no longer living. After two years as honorary Secretary-Treasurer, Warrand took over the presidency in 1931 from Geoff Pern (who had joined the Club a month after its formation), continuing in office until 1955 – a record that would be hard to emulate, let alone equal. His name will crop up periodically in this history, for much of what the Club achieved was the result of his personal enthusiasm and efforts, prompted by his keenness for skiing in general and the Club in particular. As the driving force behind the Hotham Lodge, Warrand was chairman of the building sub-committee from 1946 to 1955 and then, on retirement from the presidency, continued as a committee member for seven years to see the project through in charge of Hotham management. He has since been a Vice-president six times. During this period he was a leading figure in State skiing administration. Twice (1955-57 and 1959-61) he was elected President of the Victorian Ski Association, which made him an Honorary Life Member in 1979, and when the V.S.A. replaced the S.C.V. on the Victorian Olympic Council in 1958 he became one of its representatives. He also represented the V.S.A. on the Alpine Resorts Development Advisory Committee from its formation in 1960 until 1975, then served two years as adviser. In between all this he skied – racing in inter-‘varsity and inter-club and winning the Osborn Trophy in 1932 and 1948 and the Cambridge Cup in 1950, as well as running second in the Victorian langlauf in 1931. The late Ivor Whittaker served on the M.U.Ski C. Committee from the time of its first annual meeting in 1930 through to his departure for the Middle East with the first A.I.F. contingent in 1939. Two years later, when serving as an air intelligence liaison officer, he was posted missing on a flight over the Mediterranean. 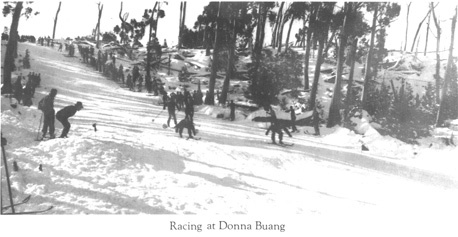 There were few aspects of Club activity in which Ivor did not figure, whether it were arranging meetings, dinners or races, getting materials for slalom flags or Club shirts, organising and doing his fair share of work parties at Donna Buang or drawing up Club tests. As a skier he was equally proficient in Alpine events and jumping, winning the Faul Trophy in 1934 and the Cambridge Cup four years later and representing Victoria in 1937. While on holiday in Switzerland in 1935 he was awarded the Silver “K” of the select Kandahar Club of Great Britain. On Club trips Ivor’s squeezebox and movie camera were an integral part of his equipment and the present U.S.C. badge – that effective symbol devised from the inititals – was his brainchild. Malcolm McColl, who remained a member until 1958, spent two years on committee and was a Vice-president from 1946 to 1956. He was honorary architect for the Hotham Lodge, drew up the working plan for the Buller Cabin and was responsible for the original design of the Buller Lodge, ultimately built to revised plans. Malcolm was a pioneer of alpine architecture in Victoria; in the 1930’s he designed the S.CNA Donna Buang Hut and the Cleve Cole Memorial Hut at Bogong and his post-war contributions began with the Alpine Club’s lodge at Hotham. He died suddenly after a game of squash in August 1979, aged 73. Within a week of its formation, the committee of M.U.Ski C. had held its first meeting and laid down skiing experience as essential for Club trips or tours. In the early days much of this was gained on day and weekend visits to Donna Buang, where the first organised outing was held on the Sunday following the inaugural meeting. It was also at its first meeting that the committee adopted a design for a badge, submitted by Warrand Begg. This had the letters M.U.Ski C. stamped in gold on a three-quarter inch strip of royal blue ribbon (amended to 11/4 inches at the next meeting). In 1932, this was superseded by a royal blue and black enamel badge in the form of a snow crystal – also designed by Warrand. Insistence on skiing experience for members of Club parties going to Hotham remained a wise pre-requisite for more than 20 years as the trip in was not for the uninitiated – or unfit! Where else in Victoria could one go to ski in those days? Buffalo Chalet was easy of access and offered creature comforts, but with its formal atmosphere (black tie and evening dress for dinner) had minimum appeal for University students. Its high season tariff in 1932 was 17/6 ($1.75) a day and a package of f-8110 ($17.00) in 1934 covered a week’s full board, first class return rail and road transport and meals en route. Like Buffalo, the Hospice at St. Bernard also catered for novices, as well as others (12/-[$1.20] a day) in addition to being a welcome half-way-house en route to and from Hotham until its destruction in the 1939 bushfires. Feathertop was a good stepping stone to the Mecca of Hotham and over the years also helped to cater for those Club members unable to be accommodated at Hotham or too inexperienced for the trip in. Here – until the 1939 fires – there was a galvanised iron 38-bunk Bungalow, built in 1925 by a syndicate. Prefabricated in Melbourne, it was transported up the 51/z mile bridle track from Harrietville on sledges drawn by six teams of six horses each. After two years’ successful operation, the company experienced problems, went into voluntary liquidation and in 1928 sold the Bungalow for £250 (it had cost £3,000) to the Victorian Railways. Under this administration, a 1934 package deal of £6 ($12.00)covered five days full board, rail and road transport, an overnight stay in Bright or Harrietville en route and a riding horse up from Harrietville. Access to Buller was tedious; it was nearly ten years after the Chalet was built by a syndicate in 1929 before the road – originally a nine mile bridle track – reached the door. Until 1935, manager Helmut Kofler’s Bottom Dump, where pack and riding horses met skiers, was around the site of the present C.R.B. snowplough garage. From here a series of tracks to the Chalet involved a climb of a little over 900 feet in a mile (it seemed much more! ), first to the corner now signposted Dump Inn, thence to the Top Dump at Boggy Corner and finally a short, steep pull up to the Chalet. Even post-war skiers have cause to remember those so-called “short cuts” up which they toiled with skis and packs late at night as a prelude to the further climb up to the Village, having on occasions walked from the White Bridge. And then there were the Bogong High Plains – accessible either from Hotham or less laboriously from the east – with their string of cattlemen’s huts and Cope Hut (specially built by the State Tourist Committee in 1929), all offering shelter and bunks for those prepared to do for themselves. At one stage more people skied on the Plains than elsewhere and in almost all the early years of the Club some members toured there. In 1931, Warrand Begg and Neville Haughton were awarded the S.C.V.’s Dave Roe Cup for the fastest time that year between Hotham and Cope Hut. They made the trip in six hours and 37 minutes and on the return journey, carrying a heavier pack, Warrand took five hours. The following year Hamish Pearson and Leigh Vial won the Dave Roe Cup for the fastest time between Kelly’s and Tawonga huts and Hamish was one of the first group of nine recipients of the S.C.VA Touring Badge, instituted that year and awarded for completion of a stipulated four of six specified tours. Then in 1933 Barton Hack won the Cup for the fastest time between Hotham Heights and Feathertop Bungalow. By the end of the Club’s first year membership had reached 41, those admitted in the early months including Neville Haughton, who remained a member for some 40 years, Arch Melvin – whose membership exceeded 50 years – and the first women: Jeane Gardner, Garda Howse, Betty Nankivell and Mary Sharp. Acceptance of the quartette was not without some opposition from a relatively new member who today would be regarded as a male chauvinist. Little did he, or others for that matter, visualise the role that women members ultimately would play in the Club, acknowledged initially by the election of Margaret Pearson (now Begg), as the first woman committee member in 1934, two years after joining M.U.Ski C.
From the outset the Club felt that connection with the S.C.V. would be both desirable and advantageous and so it became an affiliate with associate membership. This entailed paying all but 2/6 (25 cents) of the subscription (originally five shillings [50 cents] for undergraduates and 7/6 [75 cents] for others) to the S.C.V. and in return being able to use its library, hire equipment, attend lectures, participate in tests and receive copies of its magazine “Schuss” and for some years the Australian and New Zealand Ski Year Book. In addition the Club was represented on the S.C.V. committee. In the early years the association was mutually beneficial, but discordant notes were heard among the harmony and in 1938 the Club disaffiliated. During the second term vacation in 1929, when members skied in various areas, six passed the S.C.V.’s Junior Test. Four were appointed Test judges for the following year, when M.U.Ski C. members took 30 per cent of all S.C.V. Tests passed, including the third and second class and jumping Tests. Three years later the first bone of contention arose when the Club considered that the Tests were inadequate compared with those of the Ski Club of Great Britain and set about formulating its own along the British lines. These were drawn up by a subcommittee comprising Warrand Begg, Neville Haughton and Ivor Whittaker, but by the time they were ready for adoption, the Australian National Ski Federation Tests, supplanting those of the S.C.V., had come into being. In its first full season in 1930, M.U.Ski C. arranged lectures and film programmes, acquired two pairs of skis for hire, held its first championship meeting (attended by nine men) and, following an approach by Sydney University Ski Club, began to think in terms of inter-‘varsity contests and take action which led to their realisation. The following year the first Club trip was organised, bookings being made at Hotham Heights for two weeks, during which the Club championships were held. Other than in the War years, the combination of the two remained an annual fixture in the Club programme until 1951. The party of 18 men and women left Melbourne by 6 a.m. train for Bright – then serviced by a branch line from Wangaratta – arriving mid-afternoon. From there they were driven to Harrietville by Vic Wraith, whose father ran the local store in which, among other things, were relics of a Chinese joss-house from the gold-mining days. Barely had they arrived than one girl developed toothache and had to be taken back to Bright for treatment. After staying the night at Bella O’Reilly’s Coffee Palace, the party left around 7 o’clock next morning in Vic’s truck, reaching St. Bernard (13.5 miles) two hours later. After a break (and some Dutch courage?) the six mile trip on ski into Hotham began in fine weather, which later deteriorated. The route followed the telephone pole line across the ridges and saddles, climbing up and over Blowhard, around which the then 12 feet wide road was invariably invisible beneath a steep and often icy sheet of snow. In those days skis did not have steel edges and for members who did not have climbing skins, ropes were knotted around the length of the skis. From Baldy Hollow there was a steep climb of 800 feet to the windswept summit before the long-awaited descent – at a genteel pace with pack on back – to the haven of Hotham Heights late in the afternoon. Here accommodation for 30 was provided in downstairs bunkrooms and an upstairs dormitory and there was a living/dining room with an enormous fireplace about three metres across, where water was boiled up in four-gallon kerosene tins for baths (old galvanised iron type). On one occasion Warrand Begg took the wrong container and found himself facing the prospect of sharing his bathwater with the meat and bones that Bill Spargo had been cooking for his dog! The Hospice was six miles away, The nearest purveyor of cheer, sir, Stout Straus did the trip, Taking care not to slip, For he carried 12 bottles of beer, sir. After the Victorian Railways took over Hotham Heights in 1933, winter patrons were able to forward “parcels” (suitcases, boxes or whatever) of liquid and other requirements early in the year for storage until needed. 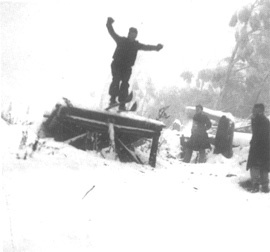 In 1932, by which time the membership had grown to 58, 45 members spent a week or more in the snow. In addition to the 25 participating in the Club trip to Hotham, a party of 20 went to Feathertop, which catered for the less experienced skiers because of its easier access. All foregathered for a dinner in Bright on the way home. Again in 1933 members were accommodated at both centres, the Bon Accord route into Hotham being adopted that year for the first time. One June day in 1931 Warrand Begg had investigated the Bon Accord on foot, carrying pack and skis. The old seven mile track from Harrietville to the hut, built in 1929 by the State Tourist Committee at 4,400 feet on Bon Accord Spur, was overgrown and entailed scrub-bashing. From the but there was a climb of 1,400 feet in a mile to the Razorback, then 3/4 mile across to Diamantina. The track was cleared for the 1933 winter and snowpoles were put in on the Razorback, being continued the following year from Diamantina to join the line from Baldy Hollow to the top of Hotham. Being shorter and less hazardous than the St. Bernard route, Bon Accord became the recognised way into Hotham until 1950. Pack and riding horses were provided for the morning journey from Harrietville to the but and cut lunches (including that “Railway cake”) were carried with the preceding overnight requirements in Railways hired-out beltsacs – forever known as bumbags. And though outgoing parties may have regretted being unable to quench their thirsts at St. Bernard during its lifetime, the chance on a fine day of a trip across the Razorback to Feathertop and the walk down the track to Harrietville was a bonus. There was one year when a member of an ingoing party slid over a cornice on the Razorback, but without injury. Despite publicity in the Press at the time (two journalist members in the party subsequently resigned from the Club), the incident in no way reflected adversely on the Club’s supervision and safety precautions. For some reason the St. Bernard route was followed in 1934, when two carloads left Melbourne after the Ormond College Ball, one group setting out from Harrietville in the morning and the other in the afternoon. Four members of the latter spent the night in Diamantina hut, which they reached in darkness. Hotham accommodation was limited to a week, after which a group went to Buller, which had also been patronised the previous week. A further party of six went to Cope Hut, where Warrand Begg was spending six winter weeks alone while working as offsider to the State Electricity Commission’s meteorological officer at its station on the High Plains. For the Club, 1934 was a red-letter year. 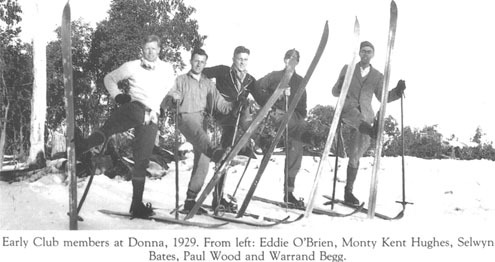 As well as laying the foundations of its own Alpine accommodation with the building of a but at Donna Buang, plans and preparations for skiing to be accepted as an official inter-‘varsity sport came to fruition with the formation of a new and solely undergraduate Melbourne University Ski Club affliated with the Sports Union, the existing Club continuing as the University Ski Club. Paradoxically, the original Club had brought about its own demise as a result of achieving one of its main objectives.